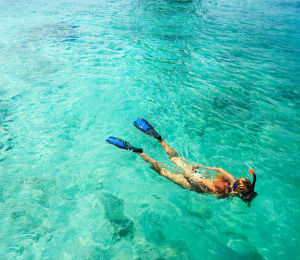 Snorkeling is a fun and relaxing sport, whether done by professionals or those just out for a good time on vacation. One thing to consider when planning your snorkeling adventure is what type of equipment to buy. While the most important thing to consider when picking snorkeling gear is the fit, and therefore no brand is right for everyone, there are some brands that generally get good reviews across the board. Below are three great options to consider next time you are planning to take a Key West dolphin swim and need some new gear. Ocean Master is one brand that snorkeling enthusiasts mention over and over. It's products include two high quality dry snorkels, which means they have been designed with the ability to prevent water from entering the gasket. For nearly a quarter century Ocean Master has been delivering award winning scuba gear to thousands of customers all over the world. One of the most popular features of their snorkel is that it is completely airtight underwater, without a vacuum effect, but then the airway automatically opens upon surfacing. This is the kind of feature that keep snorkel enthusiasts coming back. Tusa Hyperdry is another top brand. The company is based in Japan and has been around since 1952, back in the infancy of commercial diving. It is also a dry snorkel and uses buoyancy floats to be able to automatically close the gasket and keep unwanted water out. Their technology includes a high low purge that allows divers to easily clear any water that does manage to make its way in out of their snorkel easily. They have a wide range of products, from multiple snorkels to other diving gear, and are truly experts in their field. If you are looking for a snorkel with an historic name, it is impossible to do better than Aqualung. This over 70-year-old company is linked to the famous creator of the first diving SCUBA suit, Jacques Costeau, and was a pioneer in their field upon first entering the market. They are still going strong today. With many products in their snorkeling line, they have focused on comfort, quality, and flexibility. Among their many products is the Impulse Dry, another dry snorkel, which is designed with a self-draining purge valve and an especially comfortable mouth piece. Customers buy not only a top of the line snorkel when purchasing an Aqualung, they also buy a little piece of history.